It is a sensitive subject to discuss Dutch demographic reality. Since the early seventies, women have not given birth to a sufficient number of children to prevent the population from declining. According to our calculations, the native Dutch population has been decreasing for five years. Since by the end of this century, the native population will be 60% smaller while the overall number of inhabitants will have grown, it follows that the Netherlands will inevitably be transformed into a non-Western country. The Dutch establishment, like all Western ruling elites, wants people to embrace and celebrate these changes. Mathematical facts and the resultant negative consequences for the native population are framed as “populism”, “extremism” or “far right” and regarded as a thought crime. Scientists who dissent, doubting whether the coming changes will be positive for the European nations, are ousted from academia. The said changes are already visible and some accurate predictions can be made. History teaches us that such a scale of immigration will lead to ethnic conflicts. Yet, modern scholars believe there does not exist such a thing as Dutch ethnicity, which means that all who hold a Dutch passport are considered genuine Dutch. The definition of ethnicity is somewhat vague as is the case with many terms. Philosophers know this problem as the sorites paradox. Imagine a pile of sand from which we remove grain after grain. The question arises: which consecutive grain causes the pile to stop being a pile? Yet, although it is not possible to set strict boundaries between ethnic groups, this does not mean that they do not exist. Yet the same political and academic establishment which denies the existence of Dutch, Swedish or German culture recognises ethnic groups such as Kurds, Tatars, Palestinians or Jews; even if they hold citizenship of different states, they still remain Kurds, Tatars, Palestinians or Jews. Then, all of a sudden, when members of these ethnic groups receive citizenship of a Western European country, then they miraculously become Dutch, French, Swedish, German, or British as the case may be. Denying the existence of the Dutch nation was justified by the fact that its members once belonged to a large majority. As a result, all the political factions agreed that African and Asian minorities should enjoy privileges. These minorities later merged into interest groups and received Dutch subsidies, which enabled them to protect themselves from so-called extreme right-wing bigots. It was argued that democracy is about protecting minorities. Because mass immigration into Europe in general and the Netherlands in particular continued year after year while the indigenous population had too few children to prolong its own existence, demographers began to notice a worrying trend: initially small minorities are growing exponentially, Islam is the fastest proliferating religion in the Netherlands whereas the Dutch population is already in decline. 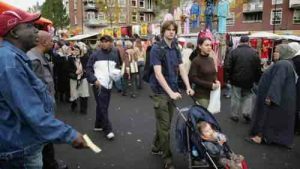 In Amsterdam, 55% of the teenagers are of non-Western descent, and only about 35% of them have a domestically-born mother. Last month, a discussion began on the country’s demographic future. Some scientists have said that the population will rise to more than 20 million. Demographic forecasters have been estimating the population at 18 million for years. According to a 1970 press article, the Progressive Liberals D66 announced that the Dutch population should not exceed 18 million, so in order to maintain this level, they claimed that women with more than four children should undergo mandatory sterilization. As in many European countries, the fertility rate at that time exceeded 2.1. Since then the number of children per woman in the Netherlands has begun to drop to 1.55. To safeguard population replacement, women should have a fertility rate of 2.1. In 1990 the Netherlands started to accept a large number of immigrants under the “family reunion” program. Guest labourers were allowed to bring in their wives and families. It can hardly come as a surprise that in 1996 the fertility rate jumped to 1.7.
immigrants has reached new, unprecedented levels. According to the Dutch official figures, between 2015 and 2017, 270 thousand non-Western immigrants entered the country while 130 thousand of them left. This influx of people prompted some demographers to predict that the Netherlands’ population will grow beyond 18 million. Why then is the progressive D66 not proposing a zero immigration policy now? Forced sterilisation of Dutch native women was a progressive idea, while stopping African immigrants from entering the Netherlands and thus boosting the number of inhabitants beyond 18 million people is right-wing extremism. The question arises, what future are the Dutch facing? The European Bureau of Statistics argues that a person with two parents born in the Netherlands is genuinely Dutch. So children named Apana, Armaghan, Asfand or Awalmir born to an Islamic Pashto family attending an Islamic school are as Dutch as any one born to Dutch parents. It does not matter that their grandparents were born in Karachi, and members of their extended family are still living in Pakistan. Theoretically – that’s at least the view of the officials and academia – the whole population can turn black and have its roots in Africa or Asia and still remain Dutch. There are already neighbourhoods in Dutch cities where one can hardly find a single white person, and still, according to the official data, there does not exist any area where the native Dutch are a minority. To get a better understanding of the fate of the Dutch, we took the official demographic data of 1985 and processed them by means of Cerberus 2.0, a software program that calculates step by step how a population grows or shrinks. We provided the software with the official annual death and fertility rates and the programme gave us feedback information about the population size for the consecutive years. For the projection beyond 2015, the programme kept the fertility and death rates constant, as it was in 2015. Without immigration, the Dutch population would have begun to decline in 2013 so as to eventually disappear. Many official statisticians expect the fertility rate to increase, but we think that due to social changes, the fertility rate will shrink further. Professor Paul R. Ehrlich, an influential American biologist, best known for his warnings about the consequences of population growth, believes that women’s emancipation with all the attendant phenomena is the best tool to prevent women from having children. Somehow ironically, women’s emancipation is all about preventing women from doing what they most like doing, i.e. raising children. Left-leaning politicians argue that a better pro-child policy will turn the tide and women will get more children. Sweden has the best feminist pro-child policy, and still, the native Swedish women do not give birth to more children. The Nordic country needs to import highly fertile Africans to increase the overall fertility rate. The native Dutch population will shrink to 8 million by 2100. The natives will slowly be replaced, but the new Dutch will not come from other Western countries nor even from East Asia. All these regions are in demographic decline. Poland, for example, persisted in having relatively large Catholic families into the eighties, so there was a large pool of cheap Polish laborers who were made use of in the Netherlands. Since then their fertility rate has dropped even below 1.3. The generation of Poles in the age bracket of 15-20 is 30% smaller than those in the bracket of 20-25. After 2020, the West will not see people coming from Central Europe anymore. The quick introduction of the Ukraine visa program was a desperate attempt to deprive Ukraine of its youth to make up for the diminishing West European working force. But even in Ukraine the fertility rate dropped close to 1.0, and Ukrainian youth will also slowly disappear. In the next decades, there will be fewer people from Central Europe coming to the Netherlands. In order to maintain the level of 18 million inhabitants, it will be necessary to reach for human resources in the southern globe. Africa and Central Asia are an endless supply of young people, so in order to keep the Dutch population stable, its elites will have to take their example of the British and French counterparts, and start transforming the Netherlands into an African nation. Sooner or later, however, the Dutch will realise that they will become a minority in their own country, and they will start to fear for their children and ask questions about how this could happen. These are facts. It is neither extreme nor right-wing scaremongering: rather, it is mathematical certainty. Migration in combination with low fertility rates will wipe out European nations, and the Netherlands is no exception. Schengen: what on earth are Merkel and her President thinking?